You’re on social media, right? And it can be a good thing. You can keep in touch with family and friends, make new friends, and learn things. Maybe even have a laugh or two. But too much of anything isn’t good for you. It’s the same with social media. Those of us with ADHD are easily distracted. And social media can distract us so well. 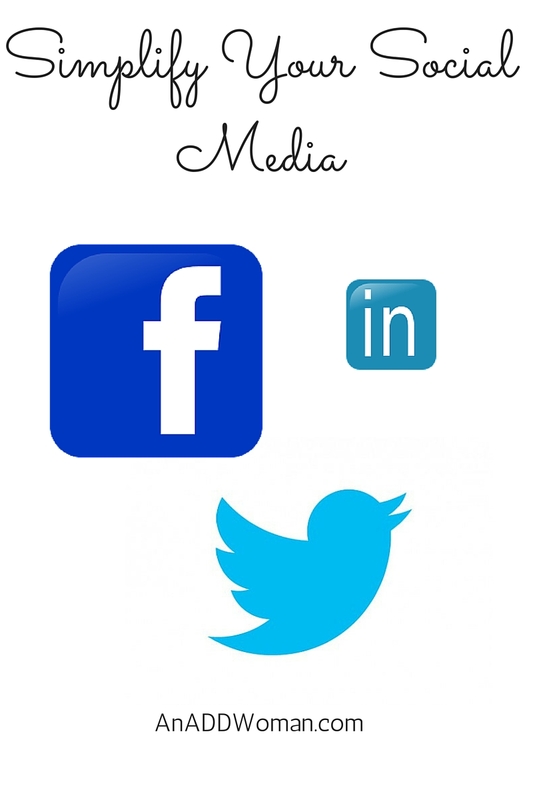 So what do you do about social media if you’re trying to simplify your life? Start by making some rules. I usually check into my social media accounts right after breakfast while I’m having my tea. And again just after dinner. I think that’s a good plan for most people. Find a couple of times a day to check in rather than all day long. Now I do tend to be on sites like Facebook and Pinterest throughout the day, but that’s because I’m trying to keep people aware of me and An ADD Woman. I write this blog in an effort to help as many people as possible, so it’s important that as many people as possible know about it. That’s where social media helps. OK, so let’s say you’ve decided to narrow down your social media time to a few specific times a day. Well, you can build in a little me time during the day for social media. And I would suggest that you add some sort of time limit as well; otherwise, it’s just not effective. For me in the mornings, when my tea is gone, I log out and get to work on something. Another way is to limit the number of social media outlets that you check each day. I belong to quite a few of them, but most of my time is spent on Pinterest, Facebook, and Instagram, in that order. I have a big Twitter account but only use it for spreading news for my followers; I rarely get on and just get caught up in tweeting. Another easy way to simplify your social media is to use a service like Hootsuite. If you use their free service, you can link up to 3 social media accounts and then see everything there. One last thing I would suggest: I see way too many people, surrounded by friends or loved ones, where everyone’s eyes are on their screens instead of interacting with one another. I know my family is guilty of it too. Let’s make a habit of putting the devices down now and then and really connect with the people right in front of you.